Austin Rogers isn’t just winning on Jeopardy!, he’s doing it in style; his own wacky, goofy style. And the people love it. And he’s one of the show’s all-time winners. The bearded bartender has now won five seven ten Jeopardy matches in a row and is making a name for himself with his quirky, playful and confident personality as well as his high wagers on Daily Doubles. 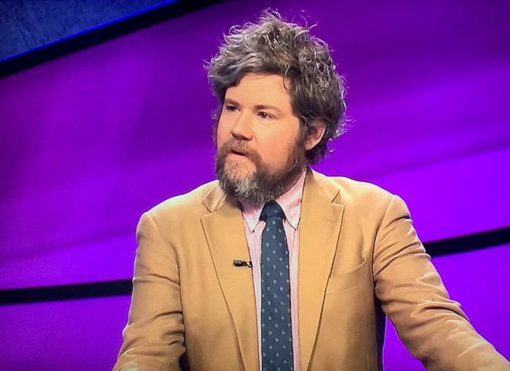 Here’s what we know about the bearded Jeopardy contestant right now. Originally from Westchester, NY, Austin Tyler Rogers currently lives in Manhattan, New York City. He works as a bartender and has moonlighted as a freelance writer for many years. After graduating from Macalester College in Minnesota with a Bachelors in Arts (History/Music), he took a job as the Events Manager for the Asia Society. He held that job for a decade before moving onto Digitas, a marketing agency for two years. We don’t know Austin’s exact age, but if he graduated college in 2000, then he’s probably 38 years old. When it comes to Jeopardy contestants, Rogers is one of those rare players that isn’t just intelligent, but also makes for great TV with his fun loving and odd behavior. Whether you like his spunky and quirky personality or not (we think Alex Trebek likes him), you can’t help but pay attention to the guy. If for some reason you’re not a fan of Rogers’ personality, you can’t help to be drawn in by his guts and courage in his seemingly-willy nilly wagering on Daily Doubles. In our time watching Jeopardy!, we’ve never seen another contestant arbitrarily wager so much on Daily Doubles so often. As of this post, he’s bet on a couple dozen Daily Doubles now — only losing on a handful of them. Where Does Austin Rogers’ Winnings Place Him All-Time? Rogers has now won a total of $365,400 in his six seven ten Jeopardy wins. His total winnings were bolstered by large winnings in back to back episodes. Rogers took home $65,600 in his fifth episode and $69,000 in his sixth win. That $65,600 was a record for one of the highest single-day winnings ever on Jeopardy. Though his total didn’t surpass Roger Craig’s $77,000 in a single day, it’s good enough for the 4th highest amount won in a single game. With that day’s winnings, he surpassed Arthur Chu’s $58,200 and was right behind Jerome Vered’s $68,000. UPDATE 10/4: Rogers won $69,000 in his sixth consecutive win. How he did it was in typical Rogers fashion: wagering $34,000 (of his $35,000) in Final Jeopardy, then winning. With the $69,000 take, he now owns the third highest single-day winnings on Jeopardy! behind Craig and Ken Jennings. Not bad company at all. Rogers now owns two of the top five spots as far as most money won in one day ALL TIME. At one point, he wagered $15,700 during a Daily Double question, and he had racked up over $42,000 by the Final Jeopardy question. That behavior, along with his hipster fashion sensibilities, has endeared him to viewers, especially on Twitter, with some users comparing him to the frontman of an indie rock band, and others to a Wes Anderson character. As of his eighth win, Austin Rogers has won $332,400 in winnings and rockets him to fifth place all-time in Jeopardy! winnings easily leapfrogging over big name contestants Joon Pahk, Tom Walsh, Roger Craig, and Ben Ingram. Next up? 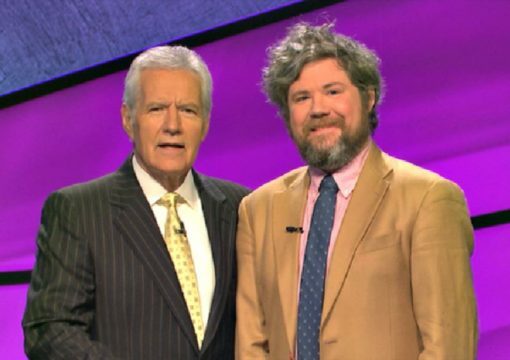 Rogers has surpassed recent Jeopardy winners Seth Wilson (2016) and Arthur Chu (2014). He’s got some work in front of him now, as he’s a full $100,000 behind Matt Jackson (#4) and Julia Collins (#3). See the full list of all-time Jeopardy! winnings here. When it comes to total wins — Rogers will has a ways to go. Not just to catch up with Ken Jennings’ ridiulous 74 wins, but even to begin to smell Julia Collins, Dave Madden, Matt Jackson or Arthur Chu. Here’s a look at the All-Time Champions List. He needs a few more wins to make a dent in the Jeopardy winning streak list, but whatever happens to Austin on subsequent episodes, we’re happy to have yet another memorable character. 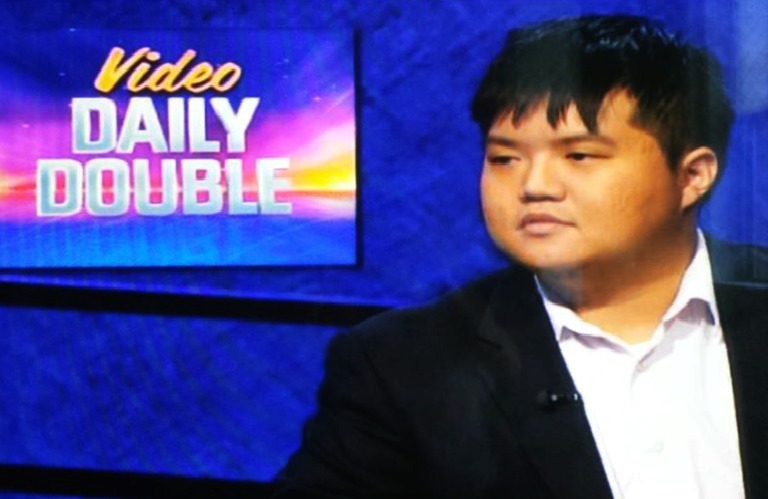 Related Jeopardy Articles: Is Austin Rogers gay?, Who is Lisa Schlitt?, Julia Collins is Jeopardy’s Wonder Woman, Seth Wilson Moves Up, Arthur Chu takes on all the ‘Haters’, Matt Jackson among Jeopardy’s All-Time Winners, Most Money Won on a Single Day of Jeopardy!